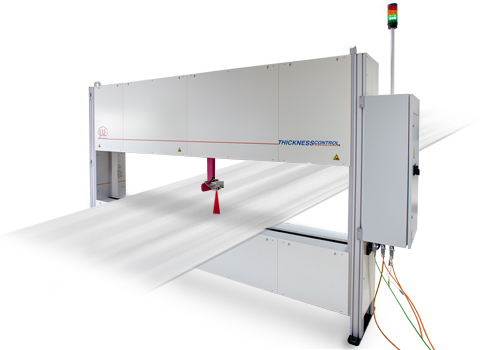 The principle of dimensional, geometric thickness measurement includes one optical distance sensor on each side of the material. The distance (=operating range) of both sensors is determined in a calibration process based on a certified measurement standard of which the thickness is added to the sum of the sensor signals in order to determine the current operating range. For thickness measurement during production, the difference between the sum of the distance signals and the value of the operating range is determined. By using special lenses, a laser beam is enlarged to form a static laser line and is projected onto the target surface. 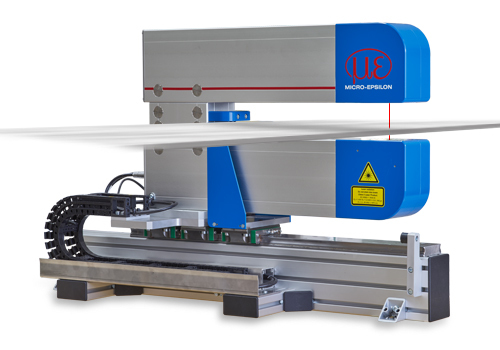 A high quality optical system projects the diffusely reflected light of this laser line onto a highly sensitive sensor matrix which detects during one measurement, depending on the sensor, a profile with 640 or 1280 measuring points. From this matrix image, the integrated controller calculates the distance information (z-axis) and the position alongside the laser line (x-axis) in a two-dimensional coordinate system. The system is equipped with in-situ calibration in order to compensate e.g. for the effects of temperature fluctuations. 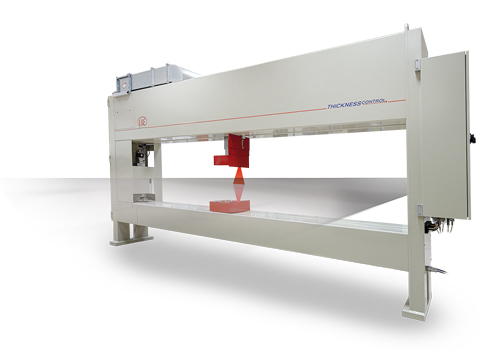 Depending on the respective application, with this calibration either the reference/calibration piece or the C-frame can be positioned. Furthermore, the correct functioning of the system can be cyclically proven at any time. The analysis software enables easy, fast verification of the measurement system’s capability, which can be automated depending on the application. 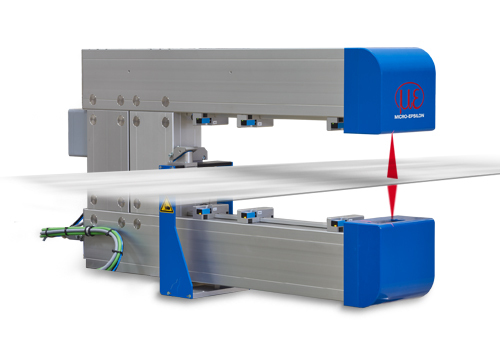 Compared to laser point sensors, laser line triangulation measurement offers improved accuracy and stability. Tilt angles, warping and deformation of the material is recognised using profile sensors and is considered in the measurement results. This enables thicknessCONTROL MTS 820X.LLT to provide high quality thickness measurements with accuracies in the micrometer range, even when the metal sheet to be measured is several mm thick and tilted. Due to their high data rates, laser line sensors have proven to be very stable in harsh environments. In situations where there is a loss of 50% of the measuring points, e.g. due to steam, residual contamination with mill emulsion or reflections on shiny surfaces, the reference line of the usable point cloud still generates very stable measurement values and is thus superior to laser point technology.